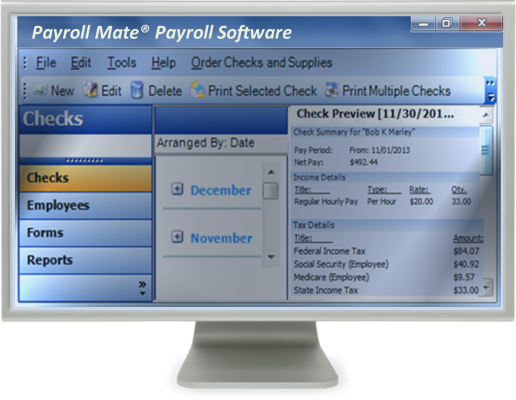 Payroll Mate® is everything you need to run payroll in-house. Our payroll system offers the features of high-end payroll accounting applications for a fraction of the price. Works with your accounting software including QuickBooks, Peachtree (Sage 50) , Quicken, Microsoft Accounting, Sage DacEasy and more. For $119 only, process payroll for up to 10 companies, with up to 75 employees per company for one calendar year. Computes employee gross pay, taxes, deductions, and net pay. Calculates federal income tax withholding (FIT), state income tax (SIT), local income tax, state unemployment tax (SUTA), state disability insurance (SDI) and federal unemployment tax (FUTA). Calculates employee and employer OASDI (Social Security portion of the FICA tax). Calculates employee and employer HI (Medicare portion of the FICA tax). Unlimited user-defined payroll deduction, income and tax types can be created. Supports different types of federal and state allowances including dependent / personal. Calculates regular, overtime and double overtime pay. Supports shift differentials. Supports fulltime employees, part-time employees and independent contractors. Supports 401(k), section 403(b) and S.I.M.P.L.E / SARSEP deferred compensation plans. Also supports cafeteria plans. Helps you track employee change history such as pay rate, marital status and allowance changes. Supports garnishment of wages such as child support and federal tax levy. Prints user comments on paystubs. Built-in backup and restore capability.Payroll Mate strongly recommends that employers maintain backup copies of payroll data in case of hardware malfunction, human error, or other events that can corrupt or wipe valuable employee and checks information. Accrues sick and vacation time / pay. Supports multiple pay frequencies including weekly, bi-weekly, semi-monthly and monthly. Supports "Tips Received Directly by Employee" and "Tips Paid by Employer". Go green with paperless PDF pay-slips (electronic paystub).Eliminate paper, postage, and distribution costs. Supports piece-rate compensation (pay employees per units or pieces produced). Supports commission pay, nondiscretionary and discretionary bonus. Supports employee-authorized payroll deductions and pretax salary reductions. Supports health insurance and health savings accounts. Pay the same employee with multiple pay rates and payment methods. Supports shift differentials. Great return on your investment. Payroll Mate will pay for itself in one or two months. Helps employers comply with IRS regulations for payroll tax data recordkeeping requirements. Runs on Windows XP, Windows 2003, Windows Vista, Windows 7 and Windows 8. For Mac, use Parallels Desktop or VMware. Payroll Mate is more capable, more flexible, and easier-to-use than computerized payroll accounting products costing times as much. Designed for any size business, from 1 to 1000 employees. If you process payroll for 10 or less companies (up to 75 employees / company) then you only need Payroll Mate for $119. You can add Payroll Mate Option #3 (for $125 more) if you want to process payroll for 100 or less companies (up to 1,000 employees / company). Start at any time during the year. Qualified US-based staff provides telephone, live chat, e-mail and fax technical support. Powerful data import engine for employee payroll setup and other information such as name and address. Exports payroll data (totals and detailed pay items) into formats importable by QuickBooks, Quicken, Sage Peachtree, Microsoft Accounting and other small business accounting software. Our business payroll software can be installed and configured to run in a network configuration where multiple computer machines at the office can process payroll. Supports payroll direct deposit by generating ACH-formatted and ready-to-process direct deposit files. The user would take the direct deposit file generated by Payroll Mate and send it to the bank (through uploading to the bank's website in most cases). In order to use direct deposit users need to have made prior arrangements with the bank to process the ACH (Automated Clearing House) file. There is no limitation on the number of checks, employees, banks or accounts that can be included in the direct deposit file. Payroll Mate Option #2 ($95) needs to be purchased on top of Payroll Mate to support direct deposit. Powerful MICR check printing engine, which helps users reduce cost and work more efficiently. Easily switch between banks and centralize all your payment operations to employees, contractors and government agencies. Printing checks in-house on blank check stock, is not only affordable but more secure and reliable. MICR check printing requires Payroll Mate Option #4 ($50). Great for trucking companies. Supports a variety of income types typical to the trucking industry (such as pay per mile), as well as salaried/hourly employees. Smoothly process payroll for truck drivers, owner-operators, office employees or sub-contractors. Accountants can provide full payroll service to their clients with confidence by using Payroll Mate and knowing that this user-friendly software will meet their needs. Ideal for farmers, ranchers, agribusinesses, estates and rural businesses. Produces form 943, handles household employment and supports payroll income types specific to the farming industry. Supports household employees and self-employed individuals. Supports hospitality & restaurant payroll including tips management. Try before you buy, download a free trial now and see for yourself how easy payroll processing can be. Prepares, prints and exports IRS Form 941- Employers' quarterly information return. You only need five minutes to review, sign and send the return to the IRS. Form 941 is due one month after the end of each quarter. Payroll Mate also prepares 941 Schedule B, which is mainly required for Semi-weekly and one-day depositors. This tax form shows the total FICA wages paid, the total FICA taxes and federal income taxes withheld. Form 941 is required of all employers, except household and agricultural employers.Payroll Mate also prepares Form 944, Employers' Annual Federal Tax Return. Form 944 can be used, in place of Form 941, by employers who owe $1,000 or less in employment taxes each year. Prepares, prints and exports Annual FUTA Return Form 940, which is required for employers to report taxes imposed under "The Federal Unemployment Tax Act (FUTA)". Payroll Mate also supports Schedule A, which is used by employers who pay unemployment tax to more than one state. Annual Form 940 is to be completed by January 31st of the following year (2013 940 is required on January 31st 2014). Powerful W-2 forms generation and editing utility. 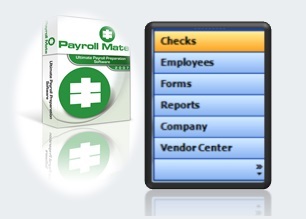 Payroll Mate auto generates W2 forms using the payroll checks entered into the system. Users have the ability to update the amounts and values for each box on the W-2 form, which makes reporting easy and convenient. Payroll Mate prints W2 Copy B, W2 Copy C, W2 Copy D, W2 Copy State 1 and W2 Copy State 2 on blank paper and prints ON preprinted red scannable W2 Copy A and W-3 forms. Through Payroll Mate Option # 1 ($25), users can Prints SSA approved W2 Copy A and W-3 forms on blank paper. The W-2 reporting feature is great for both live and ATF payroll. Comprehensive range of reports including Journal Summary, Journal Detail, Tax Liability, Deposit Requirement, Employee Earnings, Employee List, Payroll Totals, Payroll Detail, Pay Periods and Leave Hours. Reports can be printed, exported and emailed. Each report comes with the advanced options to specify the pay period being covered, list of employees and other parameters. 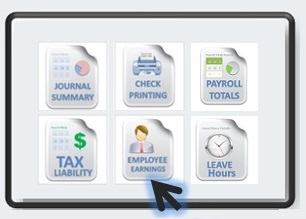 Payroll Mate gives users the information they need to manually fill-out state payroll forms. The software also supports state payroll reporting for some states. Currently the following forms are supported: Illinois Unemployment Insurance (Paperless Filing); Illinois Withholding Income Tax (Generic Report and Export to CSV file); Texas Unemployment Insurance (Paperless Filing); NYS-45 on Paper (New York Quarterly Combined Withholding, Wage Reporting and Unemployment Insurance Return); California DE 9 on Paper (Quarterly Contribution Return and Report of Wages), California DE 9C on Paper (Quarterly Contribution Return and Report of Wages -Continuation). State payroll forms support requires Payroll Mate Option #5 ($40). Prepares, prints and exports IRS Form 943, Employer's Annual Tax Return for Agricultural Employees. This return is used for reporting the withholding of FIT and FICA taxes on wages paid to agricultural workers. Form 943 is used for agricultural employees even though the employer may employ non-agricultural workers. Prepares and prints IRS Form 1099-MISC, Miscellaneous Income and Form 1096, Annual Summary and Transmittal of U.S. Information Returns. This feature is part of the Payroll Mate comprehensive vendor and contractor management module (requires Payroll Mate Option #6 for $69). © Copyright 2017 Real Business Solutions.